Ok. So September kind of got away from me, photo remake wise. There are some beautiful canning jar shots in the pool that are still awaiting my comments. Despite the current lack of feedback, I hope you all learned a little about shooting transparent but reflective materials. Rather than letting October pass me by as well, I thought I’d jump right on it with the new challenge: Pie. Pie is one of those things that seems simple, but turns out can be quite a styling and shooting nightmare. A slice standing on it’s own often requires a lot of reconstruction, or you end up with a gappy and sometimes flat mess. Not that that can’t be beautiful too. But that upstanding slice of pie that will soon be gracing magazine covers takes propping, stuffing and all sorts of fiddling. 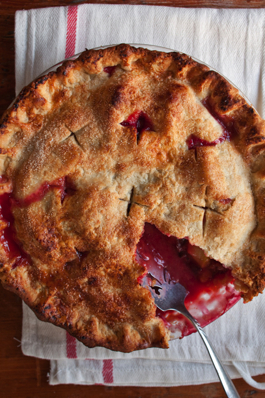 Similarly, a whole pie, while easy to style and photograph, doesn’t give much of a hint as to what is going on inside. You have to dive in to really tempt the viewer. Take a slice out, and now you start to have something. Of course, then, you also have to start rebuilding the edges. So, for this month’s remake, let’s see what you can do with a double-crusted fruit pie, shot top-down with a slice taken out. My pie was plum, which gave a lovely red hue, but you can use whatever fruit you’d like for your pie. But, do try to actually remake the photo including styling and lighting conditions! Just submitting any old pie photo you have won’t force you to study the image to figure out what is going on. This challenge will run through the end of October. This entry was posted in Annoucements, Photography Challenges and Critiques, SLW Photo Remakes. Bookmark the permalink. I’m game for this. In my experience, the most important piece of equipment for a shoot like this is a **very** sharp paring knife for getting perfect edge. I have just joined the Flickr group. I am looking forward to this month’s challenge. Your website is so informative and inspirational. I always learn a lot on each visit. As you can tell from my blog I’m really quite new to putting ‘effort’ into the photography side of it but I feel I’m beginning to get to grips with it all, slowly. Pies are one thing I fail to master unless it’s the whole pie or a pie with a tiny slice out, taking a shot of a slice of pie, no that’s never worked for me yet. Apples are cooking right now. You made me make pie! I think it’s been 1-2 years since the last time I made pie. I’m so glad I was browsing though ‘cook & eat’ cause it lead me to this!! I can’t believe I didn’t know about this awesome little challenge you have going on!! oh plum deliciousness! I can just reach into the screen!! !